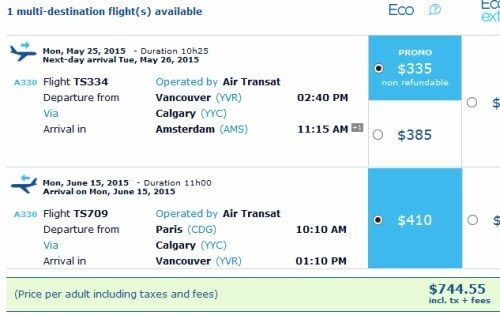 Air Transat just loaded an interesting multi-city fare into their system, it's a flight from Vancouver to Amsterdam (AMS), and then Paris (CDG) to Vancouver, for just $745 roundtrip including taxes. The same flights can be had using June 01 to June 15, for $795. For live discussion of this deal, or to get some amazing travel advice (to anywhere) from 24,099 real travelers in Vancouver, join us in the YVR Deals Facebook Group. Vancouver to Bali, Indonesia - $595 CAD roundtrip including taxes | the Philippines for $489, India for $649, and 33 other destinations on sale! vancouver, yvr, flight deals, europe, air transat, western europe, amsterdam, ams, netherlands, paris, france and cdg. 3 Responses to "Vancouver to Amsterdam, and then Paris to Vancouver - $745 roundtrip including taxes"
What about Amsterdam to Paris? Is that included? I think you need to figure that part out on your own :) I would just take the train!